Facebook is home to millions of profiles of businesses and celebrities, big and small. Many prominent personalities use the medium to engage with their fans and share important updates. And when you’re the CEO of the of a much-loved company, and also happen to be Indian, millions of fans are a given. 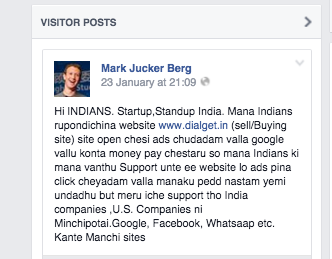 And someone, somewhere got it down pat, when they created a page for Sundar Pichai, the new CEO of Google on Facebook. While the real Sundar Pichai is busy changing the world, providing free wifi in home country, or generally minding his $570 billion company, the fake Sundar Pichai is dispensing world wisdom on this page with 66,000 fans. The page fans surprisingly include hundreds of real Google employees too. 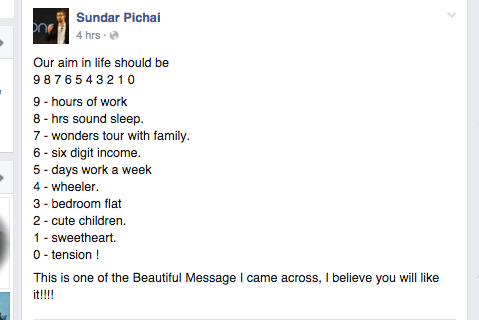 This Sundar Pichai is dedicatedly active and ensures insightful posts, keeping in mind Google’s love for numbers. He even shares inspirational stories from other companies, which fellow Googlers ardently share. 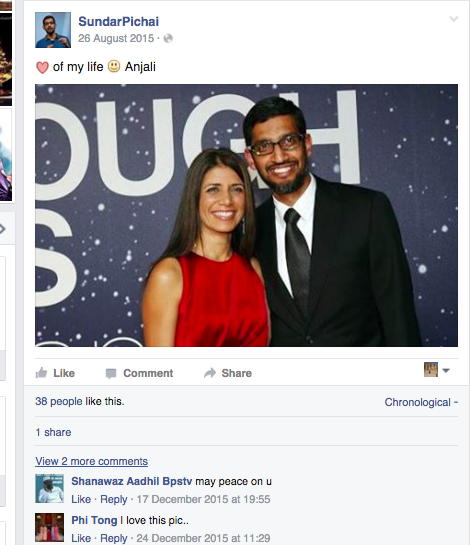 In an odd moment of vanity, Pichai “feels happy” sharing his own photo. The otherwise reticent CEO has no qualms about gushing about his wife on Facebook, complete with heart and smiling Emojis. And like any Indian, he has political opinions. Apart from serving as a fish bowl for Sundar Pichai’s own life, his page also gets comments from some friendly competitors. His ‘fans’ have pinned a lot of hopes in their son of the soil. 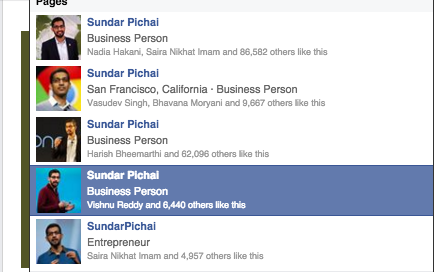 A few more clicks reveal that this is not the only one but one of the 6 fan pages masquerading as Sundar Pichai. 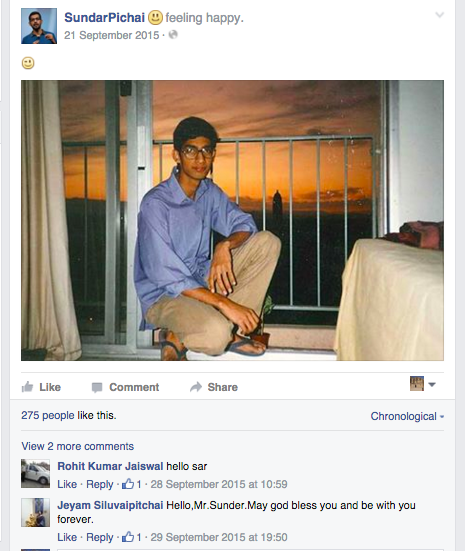 Sundar Pichai has arrived and his impostor profiles on social media is a definitive proof. Just so we are clear, this is the official personal profile of Sundar Pichai. The only official page in his life is of the Larry variety. 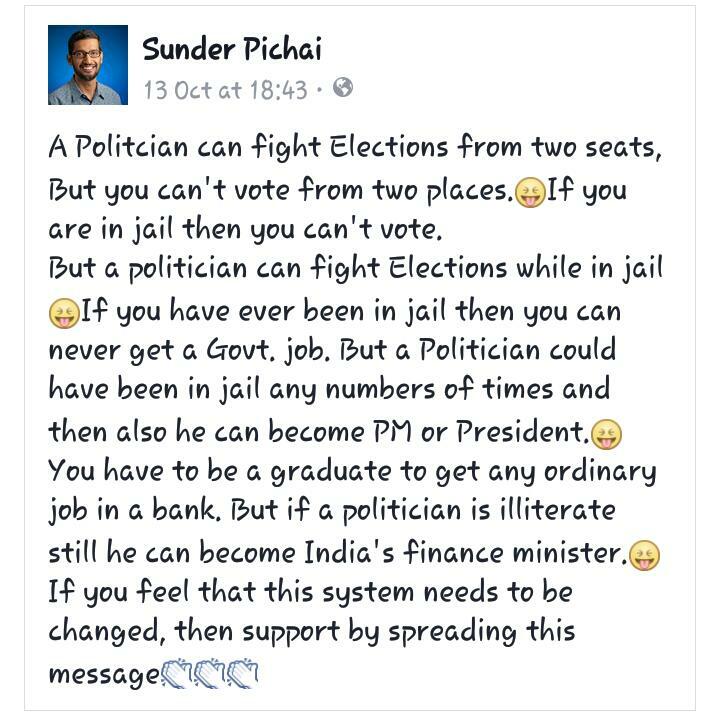 And yes we doubt the real Sundar Pichai is going to be posting a status while “feeling shocked” about his 6 other avatars on the internet anytime soon. If Pichai, in a moment of self-validation, were to create a page for himself, rest assured, Facebook will sooner or later, place the “blue tick” signifying a verified, authentic page,much like its founder’s.